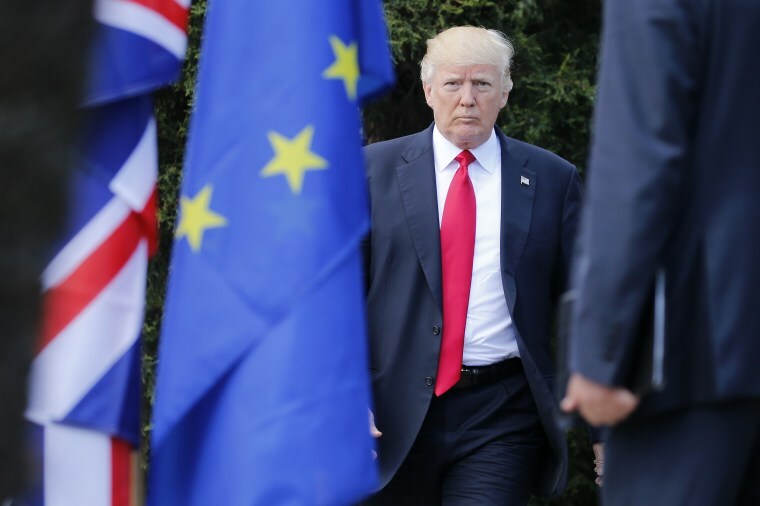 "I think the European Union is a foe, what they do to us in trade," the president told CBS News. President Donald Trump is going into his much-anticipated meeting with Russian president Vladimir Putin on Monday having called the European Union "a foe" of the United States and with the promise that nothing bad will come from the discussion. "I think we have a lot of foes," Trump told CBS Evening News in a segment of an interview that first aired Sunday on "Face the Nation." "I think the European Union is a foe, what they do to us in trade. Now you wouldn't think of the European Union, but they're a foe." Asked to explain why he would describe the E.U. as a foe, considering many of its nations are U.S. allies, Trump backtracked slightly. "No, I look at them all," he said. "Look E.U. is very difficult ... I love those countries. I respect the leaders of those countries. But, in a trade sense, they've really taken advantage of us and many of those countries are in NATO and they weren't paying their bills." Donald Tusk, president of the European Council, disputed the claim that the E.U. and the United States were at odds. The latest interview, in which the president had harsher words for the European Union and FBI Agent Peter Strzok than for Russia, follows a heated summit between Trump and NATO partners in Brussels and new U.S. charges against Russian intelligence officers for alleged meddling in the 2016 election campaign. Russia earned some moderate criticism from the president Sunday, however. "Russia is a foe in certain respects," he told CBS News. Trump hasn't announced specific goals for his meeting with Putin, but said that "nothing bad is going to come out of it and maybe some good will come out." But much of the country will wait to see what, if anything, the president will say to Putin about the 12 Russian intelligence officers charged with the bitcoin-funded hacking of the Democratic National Committee and the Hillary Clinton campaign "with the intent to interfere" during the 2016 election. The president said he might ask for Putin to send the dozen Russians who were indicted by the Mueller probe to the United States. But Trump didn't direct his tough words toward Russia, the aggressor. Instead, the president blamed the Democratic National Committee for Russian meddling, saying their digital defenses were not up to snuff. "I think the DNC should be ashamed of themselves for allowing themselves to be hacked," Trump told CBS News. "They had bad defenses and they were able to be hacked." National security adviser John Bolton seemed to imply on ABC's "This Week" on Sunday that Trump should hold Putin to account, as it would be "hard to believe" that Putin did not know that intelligence operatives in the Russian military were carrying out an operation designed to undermine the U.S. presidential election. "That's what one of the purposes of this meeting is, so the president can see eye-to-eye with President Putin and ask him about it," Bolton said. Bolton was originally scheduled to be interviewed by Jake Tapper on CNN's State of the Union, but the White House canceled his appearance after CNN's White House correspondent attempted to ask Trump a question at a news conference after last week's meeting with British Prime Minister Theresa May. White House Press Secretary Sarah Huckabee Sanders tweeted that the administration canceled the appearance because they would not be "rewarding bad behavior." Trump, meanwhile, has numerous talking points on the agenda, including the ongoing conflict in Syria and the annexation of Crimea. "I’m not happy about Crimea," the president said on Thursday, while acknowledging investments Russia has made in the region and adding he is unsure how the situation will turn out. But it did not appear Trump had high hopes to find solutions. He said in the CBS interview that he's going into the meeting with "low expectations" but believes "it's a good thing to meet."